I can't believe we are already 5 weeks into the 12 Weeks of Christmas Cookies bake-along hosted by the lovely April of Abby Sweets. You know what that means, right? Christmas is right around the corner and I'm so happy, I can't wait. This week, I'd like to showcase the humble Coconut Macaroon. For those of you who don't know me well, I love all things coconut, Bounty Bars, the traditional Goan coconut cake called Baath, coconut and jaggery filled crepes, coconut curries .... I think I better stop now, just the thought makes me hungry **smiling sheepishly**. Anyway back to the cookie of the week. This cookie is fairly easy to make. The recipe uses dessicated coconut and results in a sweet, crunchy on the outside yet chewy on the inside, cookie. Its one of my favorites and its great any time of the year, not just for the Christmas cookie platter. The cookie tastes great as it is, but you can also spoon or drizzle some melted chocolate over it. You can make tiny versions of these and add it to your assortment of petit fours as well. Preheat the oven to 180°C. Line your baking sheets with greaseproof (waxed) paper and grease the paper. Sift the flour and salt into a large bowl. Add the dessicated coconut and stir to distribute evenly. Add the condensed milk and vanilla extract and stir together to form a very thick batter. I used a piping bag with a large star nozzle (piping tip) and piped the macaroons onto the prepared sheets. If you don't want to do this, you can also simply mound spoonfuls of the batter onto the sheet. Bake for about 20 minutes or till golden brown. Transfer to a cooling rack and cool completely before storing. This recipe yields about 24 pieces. These little delightful bites disappear rather quickly, so I usually at least double the recipe. Note: Don't get startled by the watermark, the picture is very much mine, I have a little venture called Claire's Party Supplies, where I make a whole bunch of stuff to order. Don't forget to check out what the others have come up with this week. Such a simple cookie to make, yet such a classic. No Christmas platter would be complete without a coconut cookie on it. Great pick. What a great cookie! Simple but always good with coconut! i love chewy coconut macaroons! plus, they are so easy to whip up! I love coconut and this cookie is got to be in my top three favorites!! YUM!! Hubby loves coconut and would eat these up! Thanks for sharing them! I'm a coconut freak too, and these look so absolutely amazing! I love coconut macaroons! I bet your homemade version is delicious! 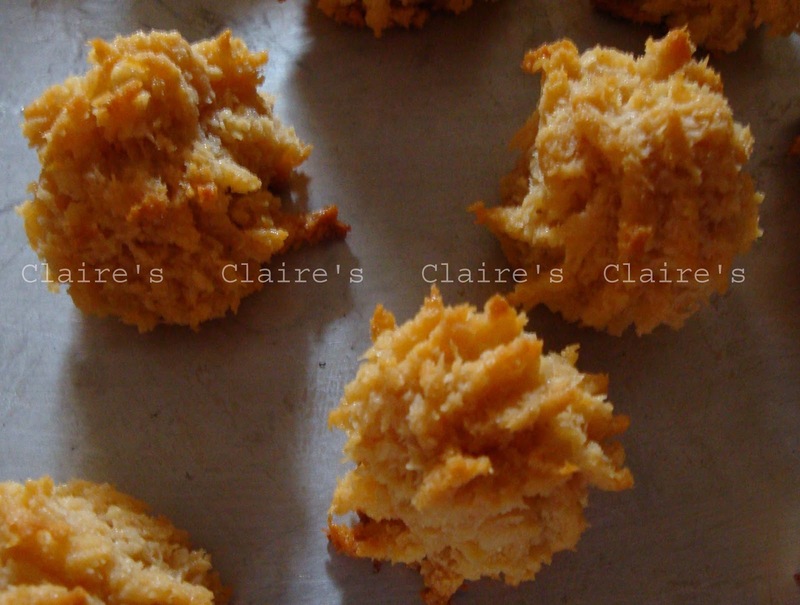 My dad LOVES coconut macaroons, he would really be thrilled if I made these. Thanks for the recipe, I'll definitely be trying them. I love coconut too! These macaroons look awesome!